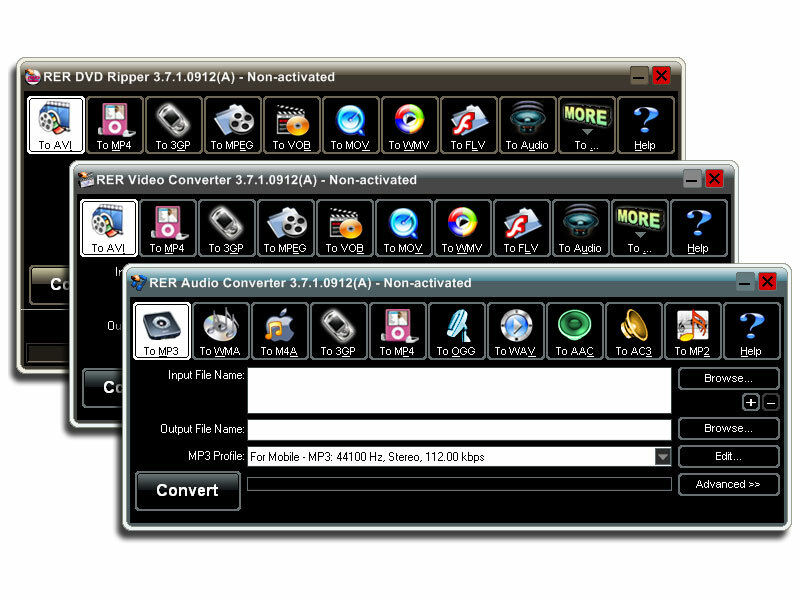 RER Media Converter Pack consists of RER DVD Ripper, RER Video Converter and RER Audio Converter, three powerful programs. All programs are easy to use and convert at superfast speed. With this media converter pack, you can rip DVD and IFO files to all popular video/audio formats and preset parameters for your Portable media Players and convert video(audio) between almost any video(audio) formats.The output quality is excellentl. ...... 264, MJPEG, TS, MP3, WMA, M4A, AAC, AC3, MP2. 2. Rip DVD content for portable device. With RER DVD Ripper, you can rip for your Sony PSP, Apple iPod nano, iPod video, iPod classic, iPod touch, iPod TV Out, Apple TV, iPhone, Zune, Smartphones, PDAs, other Portable Media Players. 3. Convert video between almost any formats. Convert 3GP/3GPP, 3G2/3GP2, MJPEG, AVI, DivX, Xvid, MPG, MPEG(MPEG-1/2), DAT, FLV, MKV(Matroska), QuickTime(MOV,QT), MP4, M4V, VOB, WMV, ASF, TS, MPEG-4 AVC, DVR-MS, H.263, H.264, X.264 to all popular video formats: MP4, MOV, 3GP, 3G2, MPEG, MPG, VOB, AVI, ASF, WMV, FLV, H.264, MJPEG, TS and SWF. 4. Convert video files to MP3, WMA, WAV, OGG, M4A, AAC, AC3, MP2, MP4 Audio, 3GP Audio. 5. Convert FLAC, M4A, WAV, AU, AIFF, WMA, MP2, MP3, OGG, AAC, AC3 audio to MP3, WMA, WAV, OGG, M4A, AAC, AC3, MP2, MP4 Audio, 3GP Audio formats. Qweas is providing links to RER Media Converter Pack 3.7.5 as a courtesy, and makes no representations regarding RER Media Converter Pack or any other applications or any information related thereto. Any questions, complaints or claims regarding this application RER Media Converter Pack 3.7.5 must be directed to the appropriate software vendor. You may click the publisher link of RER Media Converter Pack on the top of this page to get more details about the vendor.